A new and distinct variety of pecan tree named ‘Tom’. The new tree can be used in gardens or for commercial production of pecan nuts. This new tree was selected from seedlings grown from controlled pollination in Watkinsville, Ga., in 1989. The ‘Tom’ selection resulted from crossing ‘Wichita’ (unpatented) as the seed parent with ‘Pawnee’ (unpatented) as the pollen parent. 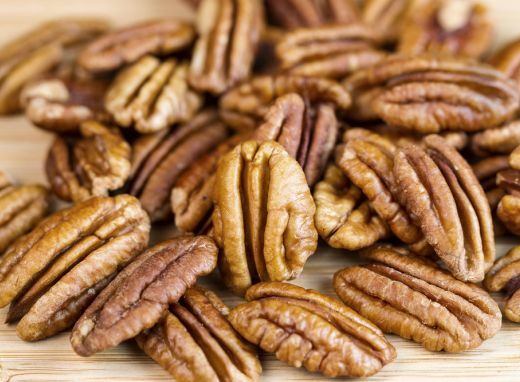 The resulting tree was selected when growing in a cultivated area at Watkinsville, Ga.
‘Tom’ is distinguished from other pecan varieties known to the inventor due to the following unique combination of characteristics: High prolificacy, consistent production, early nut maturity, a kernel size suited to the confection trade, excellent kernel color, absence of kernel speckling, and excellent resistance to the scab fungus (Fusicladosporium effusum), and high resistance but not immunity to black aphid (melanocallis caryaefoliae) and pecan leaf scorch mite (Eotetranychus hicoriae). Asexual reproduction of ‘Tom’ by grafting (top working) onto ‘Desirable’ (unpatented) pecan trees in 2006 and 2011 at NILO Plantation, Albany, Ga. and experimental plantings at NILO in 2011 and 2012 and at Graham Pecan Farm, Leary, Ga. in 2009 and at Ray City, Ga. in 2011 was performed in order to evaluate these trees. Asexual reproduction of ‘Tom’ has shown that the forgoing characteristics come true to form, are firmly fixed, and are established and transmitted through succeeding propagations.